UP B.Ed. Entrance Exam is going to be conducted on 22 April 2016 The written exam is to be conducted by Lucknow University for admission to Bachelor of Education Course in Uttar Pradesh Government and Private colleges. The application process is to be completed by 08 March 2016. Aspirants have to download the admit card from below given link to getting entry to the exam hall. Those candidates who had applied, can download UP BEd Exam Admit card from the direct link given below. Lucknow Univ. is going to conduct BEd entrance test on 22.04.2016 at 606 centres in the state. For that, admit card are going to be released online. 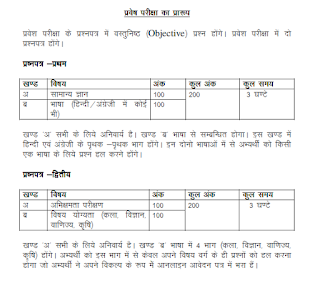 The Admit card of UP B.Ed. entrance exam are available now. You can get them from the below given link. Candidates can download UP BEd admit card from the official website upbed.nic.in via the direct link given below. The test will be held at various centres in the state. All the important details like exam venue, roll number, date and time etc. had been mentioned in them. Those who clear the entrance test will have to appear for counselling. The written test consists of 2 papers of 3 hours duration each. Both will be objective type and of 200 marks each. Paper 1 will have questions on General knowledge and Hindi or English. Paper 2 will have questions on abhikshamta prikshan and vishay yogyata. Check details in below given image. The candidates can download their admit card from UP website from here. The admit card should be printed and brought at the time of exam to the venue mentioned in them. Also candidates should check the details given on admit cards carefully. In order to download the admit card for UP BEd exam, candidates need to visit the direct link provided here (after release). It will take you directly to download page. Then candidates need to enter their registration details and click submit. Their UP BEd Admit card 2016 will be shown to them. candidates have to take a print of it and keep it in a safe place. They should remember to bring it at the time of examination.